Judging by continuity in the design of the One series, it is only natural to assume that the One M9 shares much of the same assembly and mounting techniques as its predecessor, which is notoriously difficult to mend, mostly due to an abundance on tricky adhesive holding things in place. During the teardown, iFixit did note some improvement, in the taping things together department, at least, but the phone is still a nightmare to service. Thankfully, the flagship is now covered, by an insurance policy, HTC cheerfully calls “UH OH protection” and so is the One M8, one purchased after April 10, that is. But this is only limited to the US and only good for one year, what happens when the battery dies after that? Well, you are left with the tough choice to abandon your device or pay a hefty repair bill and going by what the teardown found, it’s going to be a doozy. Going in for the disassembly, we start off with a few welcome signs of improvement – The back panel is now mounted with only two screws, found on top of the case and no adhesive whatsoever. Also, the internals are covered with a lot less protective tape than the One M8, but this one could swing either way. And, from here on out, things start to look bad. 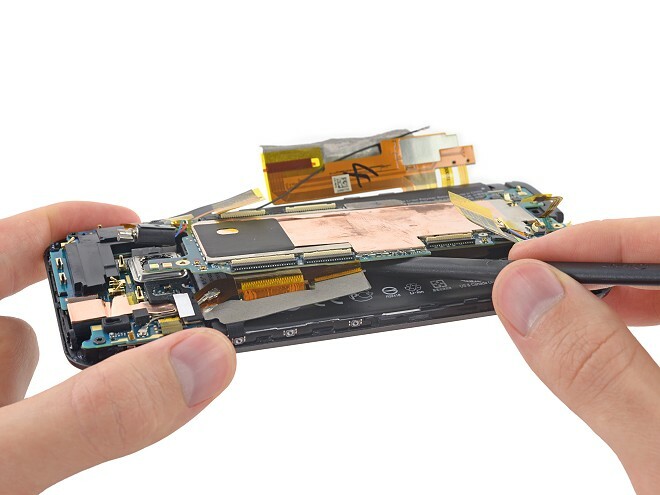 The battery is once again buried under the motherboard and the display is placed another layer down, so two of the most common repairs – a bad battery and a cracked screen are starting to look daunting already. What is even more discouraging, though, is that the adhesive is still there, quite sticky and placed heftily on both sides of the “soft” battery. And you really want to be careful with that accident waiting to happen! And just when we though – “well at least you don’t need any heat for this one”, well, it turns out, that’s how iFixit dealt with the two adhesive strips, holding the display in place. All in all, it seems not much has changed with at HTC in terms of serviceability. The One M9 is still a tough cookie to crack. We also can’t help but mention a few observations that occurred during the disassembly. It appears quality control is dwindling over at HTC, as the particular unit that underwent the procedure came with what iFixit describe as a pre-scratched screen and a faulty pixel. What is your verdict on the matter? And has seeing the ordeal of fixing the HTC One M9 changed you opinion of the Taiwanese company’s latest unibody phone?